Our moon is an enigma. The ancients viewed it as a light to guide them in the darkness, and a god to be worshipped. In modern times, it has been taught that the Moon is simply a dead rock that is caught in Earth’s gravity, with no activity. There are stories that suggest that the Moon is home to extraterrestrials, theories that it is not a natural satellite, tales of anomalous lights, and tales that NASA astronauts saw extraterrestrial ships and ruins of an ancient civilization there. There is a rumor that Apollo 13 was saved by extraterrestrials. Another story states that there are extraterrestrial bases on the Moon. There is even a tale that states that a part of the kingdom of Atlantis was once located there. Some even believe that there are cities beneath the surface of the Moon. There is an interesting account of a government employee using remote viewing as a means of seeing what is on the Moon. His experience is eye-opening! Did you know that: Aristotle and Plato wrote about a time when there was no Moon? They even gave a name of an ancient tribe of people that lived during that moonless period; Several of the NASA astronauts reported seeing UFOs while traveling to the Moon? ; the Moon might be hollow? ; Apollo 10 astronauts heard strange “space music” when traveling on the far side of the Moon? ; strange and unexplained lights have been seen on the Moon for centuries? ; there are said to be ruins of structures on the Moon? ; there is an ancient tale that suggests that the first human was created on the Moon? ; that radio signals have been detected coming from the Moon? ; that famed astronomer Sir John Herschel saw unidentified lights above the Moon during an eclipse? ; that ancient Bolivian symbols tell us that the Moon came into Earth’s orbit around 12,000 years ago? ; a psychic was used by the government to relay information about the Moon? Tons more. Tons of illustrations with A to Z sections for easy reference and reading. Now Shipping! 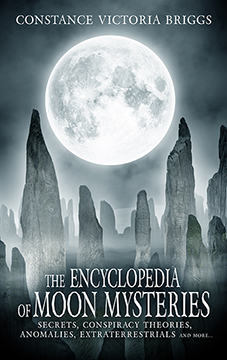 THE ENCYCLOPEDIA OF MOON MYSTERIES: Secrets, Conspiracy Theories, Anomalies, Extraterrestrials and More By Constance Victoria Briggs. 152 Pages. 7x10 Paperback. Illustrated. References.